Look at this magnificent photograph of part of the crater wall of Victoria Crater, taken recently by the Mars Rover Opportunity. It is times like this when I find myself dumbstruck by our ability to invent technology that compliments our inquisitive nature. This photograph is from another world. No one has seen this sight before now. Amazing. The Mars rover Opportunity--poised on the rim of 2,500-ft.-wide Victoria Crater--will begin its dangerous descent in mid-to-late July after passage of a massive Martian dust storm, which is also affecting Spirit on the opposite side of the red planet. Going into the 230-ft.-deep Victoria will be a high-risk operation "but the science is compelling and the exploration is compelling, so we're excited about this," says John Callas, Mars Exploration Rover project manager at the Jet Propulsion Laboratory (JPL) in Pasadena, Calif.
Victoria is many times deeper and wider than Endurance Crater that Opportunity explored in 2004. After Endurance, the team figured, Why not head for Victoria? And they made it, but not until getting stuck for weeks in a sand ripple, a scary experience. Opportunity must climb or push through another ripple at the last couple of feet as it heads in, but now the team knows what to do. They also know through ground testing and experience at Endeavour that the 20-25-deg. slopes of Victoria should pose no serious problem, at least initially. Opportunity has already driven on even 30-deg. hard rock slopes. The issue farther in will be whether the slopes are sandy with potential traps, or hard and easy to drive on. Victoria has many layers of exposed bedrock, billions of years worth. It was formed by a large meteorite impact as far back as 2-3 billion years ago. "This is an ancient crater with ancient rock," says Squyres. Importantly, over the eons, wind and perhaps water have eroded the walls, forming an even larger crater with rock promontories and alcoves that expose bedrock still in the same layers laid down when the planet was formed and unshattered by the meteorite. With Victoria, "we will really be making the first good vertical slice through an impact ejecta blanket and crater walls on another planet," says Squyres. Opportunity will spend weeks or months in Victoria, named after the only ship in Ferdinand Magellan's fleet to complete a circumnavigation of Earth. 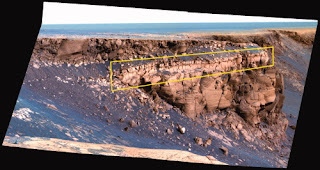 Opportunity will enter at Duck Bay, a site named by Magellan on the voyage. These two rovers, Opportunity and her twin sister Spirit, are astounding little machines. They flew tens of millions of miles across space, only to be rather unceremoniously dumped on the surface of Mars surrounded by a bunch of large airbags. They were initially designed to last around 90 days and travel no more than 600 yards. Each of them has now lasted three and a half years and driven over 15 miles. They each, on opposite sides of the planet, have confirmed that Mars once had standing and flowing water. They have taken pictures of clouds and small tornadoes. As awestruck and excited as I am about the discoveries made on another planet, I find that I am also rather sad. What we have learned is that Mars almost “made it”. Except for the lack of a few unknown features (such as a larger mass to give a greater gravitational field, very active volcanoes belching out a protective atmosphere and a large magnetic field to protect the atmosphere from the solar wind), Mars could have been another Earth. It had all the basic components. Just imagine another habitable world, just next door. It’s quite sad that it didn’t quite get there. This is just one more piece of evidence that our own Earth is a very unique and singular place, that we better take care of. There is no guarantees that it will remain as the nice, tranquil place it is now.